A red velour rope hung from two posts as found in movie theaters, subtly guides customers to order at the front counter when they step inside. A small retail space is tucked in the back behind the Proofer Lounge — a remnant from the building's former history as a bakery, which now provides intimate and semi-secluded seating. Gena Burghoff designed the new space utilizing baking tins, also a reminder of the building's history. PREROGATivE's addictive fries — hand-cut on premises from local potatoes — are blanched and fried in sunflower oil before being bagged and plated with a finger-licking tarragon aioli. The artfully composed PK Salad consists of spring mix, dehydrated apples, dried apricots, radish drizzled with cinnamon vinaigrette. Decadent sticky toffee pudding drenched in fresh cream and warm caramel sauce. A couple from down the road in Roscoe chose a spot at the cozy bar near the front window. I am enamored with Red Lodge. This small community under the Beartooth Mountains is a secret enclave of good chefs. Here is a town that satisfies appetites for both a mountain lifestyle and an intimate place to raise a family. Moreover, there is an audience craving good food. On this day after ice had finally melted off the roads, my husband and I drove from Billings for lunch to taste what Chef Chris Lockhart and his wife Gena Burghoff were cooking up. In 2015, they helped open Ox Pasture with owners Alexia and David Leuschen and nourished diners for three seasons. Last summer Ox Pasture provided a space for a pop-up by Chef Philip Guardione and his Sicilian kitchen, Piccola Cucina, now closed for the season. In the old City Bakery space Lockhart and Burghoff created PREROGATIvE Kitchen with co-owner and chef Danny Mowatt about a year ago. Prerogative means “a right or privilege exclusive to a particular individual or class.” The word alludes to entitlement and privilege. My husband and I took the prerogative on this day to step into this rustic, chic and quirky place, once housing the historic bakery. In the entryway, as notes of flamenco guitar danced off the black metal ceiling and concrete wall streaked with gold leaf, I was captivated by the image, PREROGATIvE’s logo, created by Louis Habeck, of a lamb dressed in a blue suit jacket with a loosened pink tie clutching a plucked chicken by the leg. A red velour rope hung from two posts as found in movie theaters, subtly guided us to the order counter. Before we could even think about food, we noticed the wall of wine with the bottles presented and described. 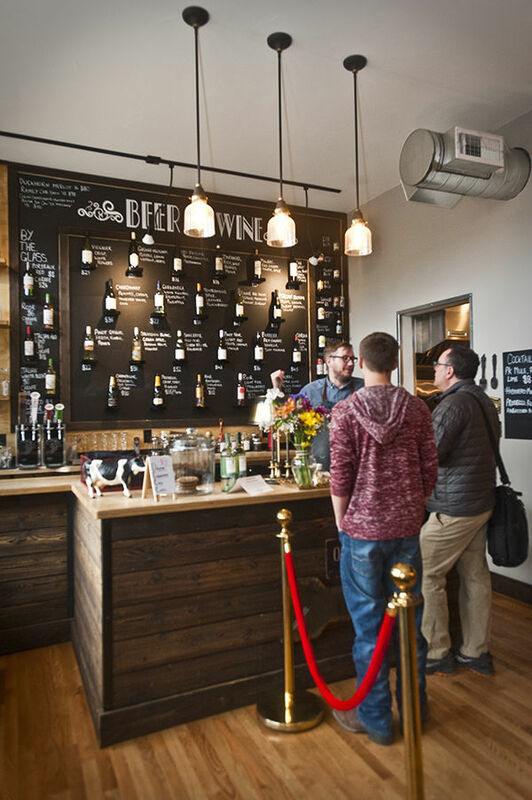 Individual bottles were spotlighted and described such as, “Pinot noir, lushy, red fruits, coconut, vanilla," or another, “Sauvignon blanc, crisp, kiwi, gooseberry." We were tempted to secure some wine, but hunger overshadowed thirst. To order we turned around to look at the large blackboard on the wall behind us. The menu was divided into salads, proteins, "smalls," sandwiches, sauces and desserts. From “smalls,” I ordered celeriac soup with truffle oil, Parmesan and scallions followed with risotto sliders breaded with panko and made with mushrooms and goat cheese accompanied with pickled onions. My husband chose fries with tarragon aioli and a fried cod "sammie" with beer battered fish. After deciding on what we wanted for lunch, we wandered to the back of the restaurant to peruse the retail area. We made our way back to the dining area, with its old cupcake and bread baking pans line the walls. We took a seat next to a curtained enclave with blue velvet curtains housing two cushy red tufted wing-back loveseats. “The vibe we wanted to convey was that of fun, comfort and something you will not easily forget,” Gena Burghoff said. I will not soon forget the white bowl with wafting steam arriving at the table. I eagerly stirred in the sprinkle of scallions and cheese into my celeriac soup to swallow a spoonful of creamy comfort. Then two small puffy risotto patties cozied between two palm-sized buns spilling with fresh greens presented on a cutting board slid in front of me. I clasped one of the burgers and bit into ying and yang — crispy intermixed with soft, sour with sweet, and fresh with melted. My husband’s fish sandwich reminded me of the fish and chips I recently had in Whistable, a seaside town in northern England. A shared bite showcased moist fish encased in a crunchy coating sandwiched between a just-soft bun with the right ooze of tartar sauce and lining of fresh greens. On this day, we were glad to make PREROGATIvE Kitchen our prerogative destination in this town under the Beartooths. Locals Soumaya (left) and Donna Mae stop in for an mid-afternoon coffee and bit of sticky toffee pudding. "A dessert we always have no matter what," says Chris Lockhart. 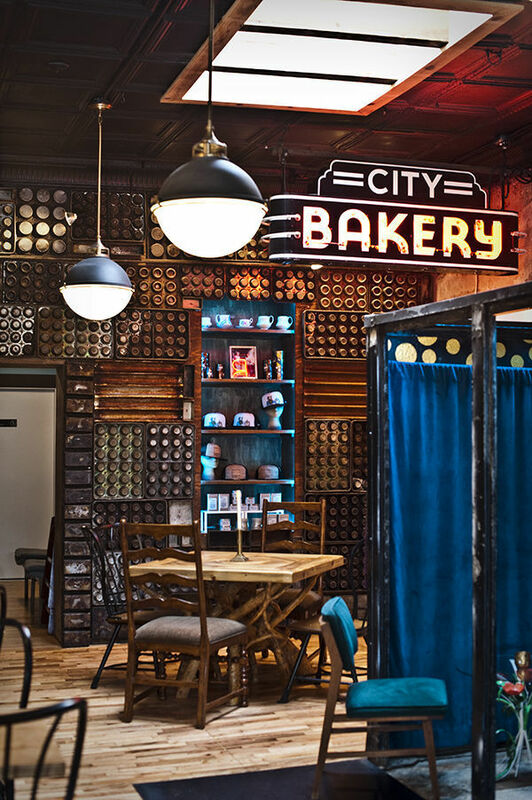 Gena Burghoff designed the space utilizing baking tins as decoration, a reminder of the building's past as the City Bakery. Both lavatories are quite unique. "Believe it or not, a lot of selfies are taken in here," laughs Chris Lockhart. Gena Burghoff came up with memorable motif. The back retail space offers a full wall lined with shelves holding unique gifts, kitchen tools and art plus a bit of swag amid baking tins and trays from the business that previously occupied the space. PHOTO COURTESY LOUIS HABECK Left to right Danny Mowatt (chef + co-owner), Chris Lockhart (chef + co-owner) and Gena Burghoff (co-owner and marketing manager). A keto dieter's dream: Roasted bone marrow with pickled veg and baguette. Roasted carrots with truffle vinaigrette is just one of many daily sides. A tartine, or open-faced sandwich, on dark rye with roast beef, mustard may, onion jam, pickled onions and pickled mustard seed. Stella Fong, author of 'Historic Restaurants of Billings and Billings Food' hosts 'Flavors Under the Big Sky: Celebrating the Bounty of the Region' for Yellowstone Public Radio.